First, I will say a few words about my decision to purchase a bicycle. Then, I'll discuss my decision to purchase a single-speed bicycle more specifically. Finally, I'll provide the initial review of the bicycle itself. Finding time to exercise is always a challenge for people like me, who like to keep themselves busily accomplishing as many little things as possible. My morning commute to work, in absence of all traffic, takes about fifteen minutes' driving time. According to Google Maps, however, a bicycle commute to work would only take about thirty minutes - still a perfectly reasonable commute. To sweeten the deal, the gym to which I have a subscribed membership is right next door to work, meaning that I have the ability to shower and dress after my bike ride. After work, if I elect to do so, I can head back to the gym for a strength training workout and a quick ride home. Thus, I will be back to twice-daily workouts without taking much additional time out of my day. In fact, I will have fully incorporated twice-daily workouts into my existing routine. Not bad. Furthermore, the commute to work is a short one, and I will be able to avoid most heavy traffic. This might mean that a bicycle commute could prove to be safer and more pleasant than my existing drive. The weather here is warm enough to provide bike-friendly conditions all year long. Considering all of the above, there was really no reason not to buy a bicycle and start riding to and from work every day. Next Question: Why We Single-Speed Bike? No, I am not really a hipster. My thinking here involved a few key points that kept playing themselves over and over in my chain of logic. My history as a biker is not particularly glorious. As a child, my parents purchased me a variety of inexpensive BMX bicycles. I was never much of a trickster; I couldn't really even pop a wheelie. Nonetheless, I was a faithful bike rider. I used my childhood bicycles as a reliable form of transportation to and from school, baseball practice, friends houses, and so on. Occasionally, my family would take leisurely rides together, but that's it. When I got a little older, bike trends changed from BMX to mountain biking. Like every other kid my age, I wanted a mountain bike, and my parents were happy to acquiesce. They bought me another inexpensive mountain bike, and my friends and I would casually ride them in the foothills looking over the community. Again, though, I never took to mountain biking seriously. I it was fun to ride over smooth trails, twists and turns, and so forth, but my primary interest was in the bicycle's many gears and my ability to get from Point A to Point B at high speeds. Primarily, my mountain bike was a form of transportation. By my final years of high school, I was riding to school daily, and otherwise not biking at all. After graduation, my older sister - an excellent and avid mountain biker - took me under her wing and introduced me to what might be called more serious mountain biking. It was a lot of fun for a young, active guy just out of high school, and a great way to get outdoors and site-see. Despite that fact, I found the technical demands of mountain biking to be less than pleasant. My uneasy sense of balance kept me out of danger and away from all the best rides. I struggled with the sport for a couple of years before relegating my newer, fancier mountain bike to a more familiar role: transportation. In college, I very much enjoyed taking my bicycle to school. What I didn't enjoy were the fat tires, small wheels, and squishy suspension of a bike built for mountain climbs, rather than city streets. In fact, this bicycle was a birthday present from my parents, and at the time I had told them that what I really wanted was a road bike. In their defense, the bike they ultimately gave me was a much better bang for the buck and had some very good-quality components, excellent construction, and very appealing cosmetics. But for a rider more interested in transportation, it just wasn't a great fit. Consistently, my bicycle needs have involved personal transportation, on city streets, and with minimal manipulation of gears. My bicycle use has involved almost no off-roading whatsoever. Simply stated, I wanted a road bike because I ride on the road. I wanted a single-speed bike because I only ever use one speed, no matter how many speeds I have access to on a bike. So when it came time to purchase a new bike, I kept transportation efficiency and limited gears in mind. A single-speed road bike was the obvious choice. When I found the line of bikes offered by BikesDirect.com, I couldn't resist! Finally, I was buying a bicycle I could look forward to riding in exactly the way I wanted to ride it. I picked up my new bike yesterday. I tried to pick it up in my sedan, but the trunk was just barely too small to fit the box in - by about two inches. So I drove home, and returned to the UPS depot with my SUV. That worked much better for transporting a large parcel. I brought it home, opened the box, took out all the parts, made a quick inventory, and then finished up the assembly. Bikesdirect.com indicates that the bike comes "90% assembled." What this meant in my case was that I had to install the front wheel, the handlebars (which were already attached to the brakes), the seat, and the pedals. I also took time to tighten all existing connections, but was pleased to find that the only ones that were loose were the ones on the rear wheel. It is a nice bike, with a few cost-saving components. Most notably, the stem is cheaper than I'd prefer, as are the brake levers. I will probably replace these when the grips on the handlebars wear out. The brakes themselves are okay - not top of the line, but easily in the middle of the pack and should work fine for me. The saddle isn't expensive, but it is much better than I anticipated. It is a little heavy and is more padded than a more serious biker than I would prefer. But this is great news for me, because I wanted something with a bit more cushion anyway. The wheels seem excellent, which was one of the main selling points. Both wheels seem true to my eyes. I will be able to judge that a little better once I get some air in the tires. The front wheel may need a little minor truing, but it looks fully functional for short rides and is certainly admirably true for a factory-direct shipment. The tires are about average or slightly below, and I look forward to wearing them out so that I can replace them. One cool thing is that the bike came with the fixie cog. The description on the website said that it came with a flip-flop hub, and that I could add a fixed cog later if I wanted to. No need - it's already there. I can switch to fixie riding as soon as I become more comfortable with the ride. I don't know a lot about frames, but this one looks good to me. It is light weight. The paint job is mostly good, if a little thin on the under-side. So far, I am impressed with Bikesdirect.com - they are pretty good if you know what you're getting. 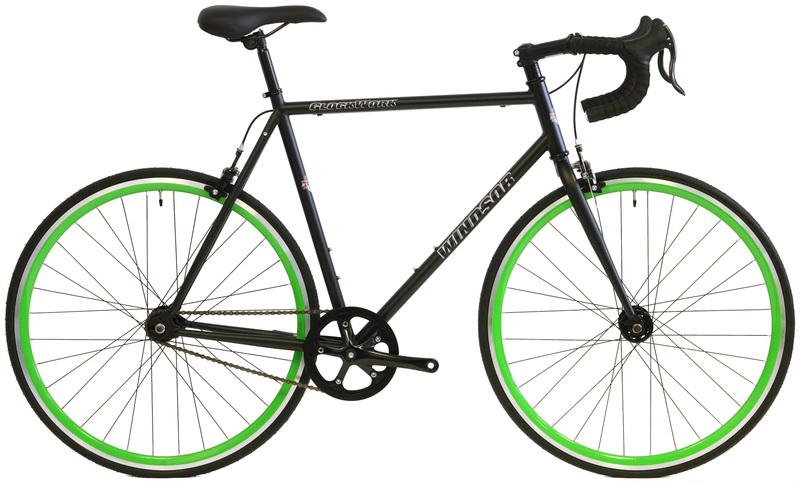 I bought a $300 bike and seem to have a high-mid-range bike with a couple of cut corners that are not particularly expensive upgrades. I wonder what their high end bikes are like. I don't have a strength-training workout tonight, so I'll pick up an air pump on the way home and give it a spin around the neighborhood, ending at the bike shop for a final tune-up.